With the rapid development of economy and the improvement of people’s living standards, people’s demand for large-capacity washing machines, large-screen televisions, automobiles, aerospace and other large-scale products has become higher and higher. Large injection molding was born. At present, there is no uniform standard for the division of large injection molding. It is generally believed that molds with clamping forces above 6300 kN, or injection volumes above 3000 cm³ can be called large injection molds. 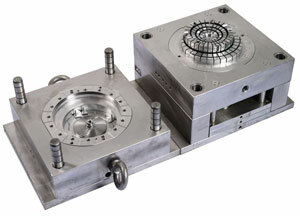 At the same time, a mold with a weight of more than 2 tons is also called a large injection mold. The characteristics of large-scale injection molds, compared with ordinary plastic injection mold, large-scale injection molding products have large volume, high weight, high mold temperature accuracy, complicated structure, high cost characteristics, large-scale injection molding have unique requirements in the mold design, mold selection and other aspects. Development status of large-scale injection molds. At present, there are some foreign professional injection molding manufacturer who specialize in the large scale molding design, like DME Corporation (USA) and Ikegami mold company (Japan). Because the research and development of injection molding in China started later than developed countries, many technologies and equipment still need to rely on imports. However, with the rapid development of China's injection industry in recent years, injection molding technology has a considerable progress. Wang Qiang proposed to use 3Cr2Mo steel instead of the traditional #45 steel on the basis of analysis of ordinary plastic mold materials. The 3Cr2Mo steel is suitable for the manufacture of large-scale injection molds by investigating specific application examples of 3Cr2Mo in the TV shell injection molds, which is of great significance for the development and optimization of large-scale injection molds. Wei Xuanwei through the program control valve gate and the injection mold common gate analysis and comparison, the program control valve gate in the large injection mold application feasibility. This research has important reference value for exploring the application of CAE technology in the production of large thin-wall injection molds.